Product #18724 | SKU BE11642 | 0.0 (no ratings yet) Thanks for your rating! 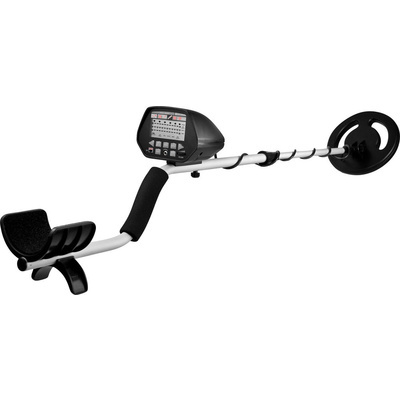 The WINBEST Pursuit Edition Metal Detector from Barska offers multiple modes of operation, adjustable sensitivity, and a user-friendly LCD display. The display indicates the likely type of metal a detected object is made of, and the notch setting helps you ignore junk and concentrate on more interesting finds. The Pursuit Edition features an 20.3 cm search coil that is weather sealed and capable of detecting metals even in shallow water. Detection indicators are also audible through the built-in speaker or 1/8" headphone output. Displays probable metal type with directional arrows, target depth, sensitivity level, operating mode, discrimination / notch range, and low battery indication. Reject interfering signals from some metals by setting the discrimination and notch settings to your desired metal. Easily identifies ferrous objects with the assistance of distinct tones for different metals. Carry and operate your metal detector with ease and comfort. Adjustable stem ranges from 22 - 30" (56 - 76cm). Detect objects in water by submerging the weather sealed 20.3cm search coil. Connect headphones to the detector's 1/8" headphone jack and adjust the volume with a dial conveniently located on the control box.